Lately I've been dabbling a lot in raw and vegan food. This isn't a huge stretch for me, since I've been (mostly) vegetarian for 20 years, but it's still a shift. One of the biggest changes has been juicing. 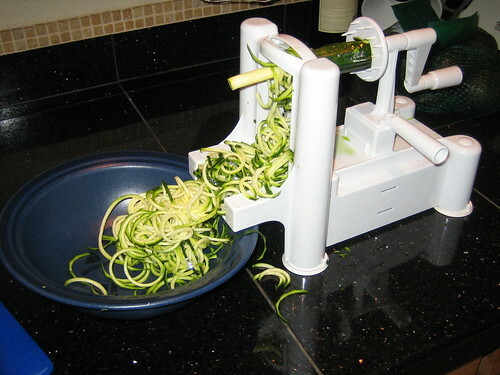 I never really understood the benefit of juicing veggies before. Basically, you get all the nutrients without having to put your body through the work of digestion. Because you're eliminating the fiber, you can consume much higher quantities of these nutrients. What you end up with is like super-charged vitamin water. I've been juicing most mornings for about 2 weeks now, and I'm hooked. The combination of the physical lightness I'm feeling with the energy burst from the juice is addictive. 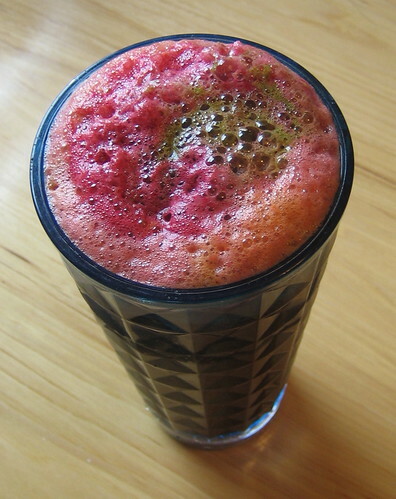 I've been playing with all sorts of combinations, but usually throw in most of the following: 1 beet, 2 stalks celery, 1/2 cucumber, 3 carrots, 1 apple, 1 Meyer lemon, a handful of dark greens (beet, chard, spinach), parsley or cilantro, fresh ginger. Yum. 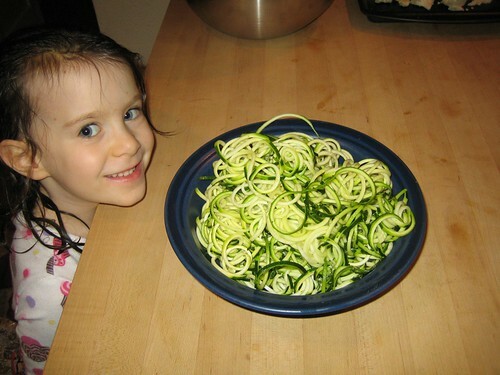 I've also discovered a fabulous tool for creating spiral “pasta” out of raw zucchini. 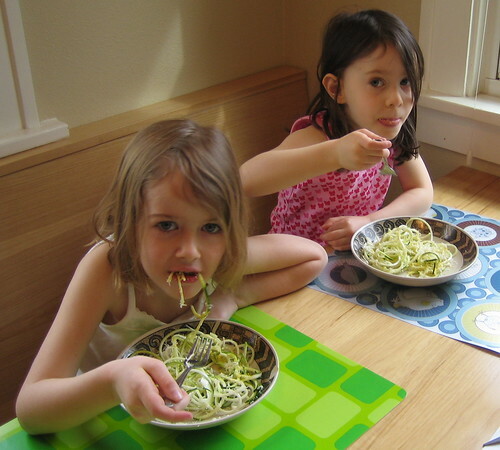 It has passed the taste test of 3 discerning, little girls who actually preferred it to the wheat pasta we made as a back-up! I love it tossed with fresh, raw pesto, but for the girls I used olive oil, nutritional yeast, sea salt, hemp seeds, and a bit of fresh parmesan. I'm beginning to dabble more with vegan and/or raw recipes, so look for those in the coming months. I can tell you this, in just 2 weeks, the extra “fromage” that's been around my middle since the France trip is melting away. That's not what got me started in this direction, but it certainly doesn't hurt! Saturday I scored a Juiceman Jr at a yard sale, brand new still in box. 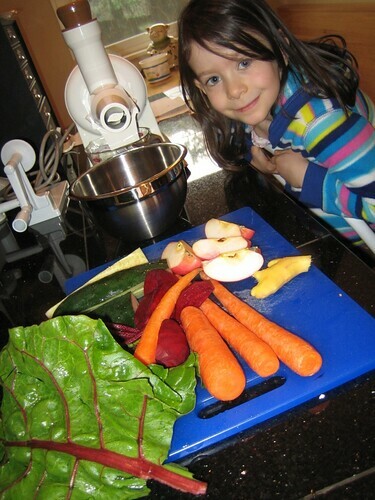 This morning for breakast we juiced 6 carrots, 1 pineapple, 1 apple and 2 dozen cherries - it was delicious! I can't wait to try your recipe. I know you've been juicing for a while now so I'd love to know your other fav fruit/veggie combos.